Greater Celandine is not easily confused with other wild plants on this web site. Delicate, almost hairless perennial, from April to October, Greater Celandine is found in hedgerows and banks. A garden escape, it has become naturalised in waste places and usually grows not far from houses. The distinctive yellow flowers (2-3cm across) have four well-separated petals, two sepals and are held in loose umbels on brittle stems. These stems, when broken, are found to contain a yellow/orange latex. The pretty leaves are pinnately divided and somewhat greyish in colour. 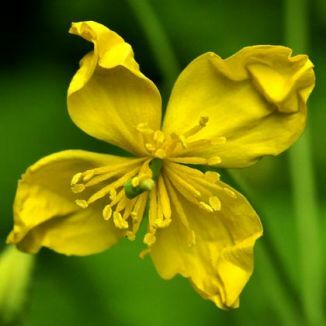 An introduction into Ireland, Greater Celandine has no family connection to Lesser Celandine, the latter belonging to the Ranunculaceae family, whereas Greater Celandine belongs to the Poppy or Papaveraceae family. I first found this plant at St Mullins, Co Carlow in 1981 and photographed it in Co Wicklow in 2009. 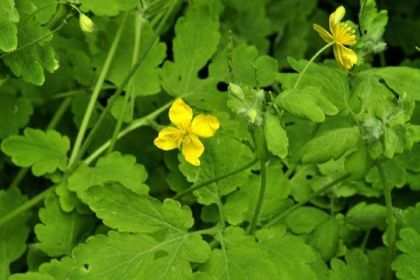 Greater Celandine is widely used by modern herbalists to treat conditions such as asthma and bronchitis as well as being a recommended treatment for warts and other skin problems. The sap from its stems is quite caustic and, in Chinese medicine, the application of this fluid helps to rid the feet of corns.